...Roper Pumps & Agriculture Solar Powered Water Pump Power Increases Efficiency, Lowers Costs and Maintenance. We offer tailor-made solutions that work with you to create energy cost savings. Roper Pumps and Agriculture Solar pumps play a leading role in clean energy, greenhouse gas reduction and potable water supply efforts along with the application of advanced production and process technologies. Water is found everywhere, covering 70% of the earth’s surface. It is essential to human, animal and plant life. It is critical to industry of agriculture. It can be incredibly powerful. Harnessing its virtues and controlling its power require pumping and power supply systems that can handle almost unimaginable volumes and pressures with complete reliability. 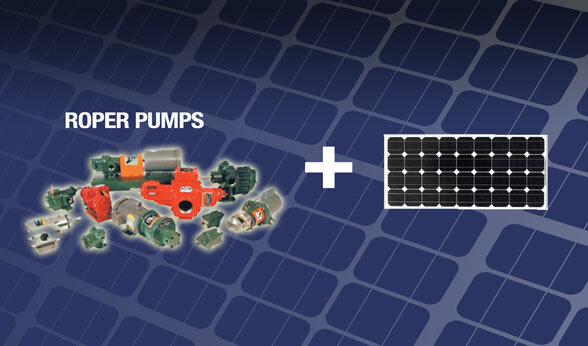 Roper Pumps and Agriculture Solar build quality into everything that we do. This requires every member to focus on details and to maintain a passionate commitment to quality. • Comply with the international quality standard. • Communicate our quality policy and objectives and ensure responsibility and accountability are understood. • Provide the training and support needed to produce quality output. • Make continuous improvement a part of every day by fostering a team approach to defect prevention and problem solving. • Build robust processes, and relentlessly pursue the elimination of variability. • Never forget that our customers are the reason why we are here. Roper Pumps and Agriculture Solar solutions driven engineers continue to develop new and tested products tailored to specific applications. The latest technological advances are also applied to our existing equipment through upgrades and product improvements with the objective to withstand the stringent conditions encountered in the field. At Agriculture Solar, Roper Pumps and Agriculture Energies can be your simple water pump solution. Roper Pumps have done pioneering work in developing and manufacturing positive displacement pumps dates back to 1857, and more than 150 years later it is recognized as the leading manufacturer of pumps. With a large installed base, Roper Pumps and Agriculture Solar power supply have both the expertise and experience to help you solve your most challenging pumping problems. Agriculture Energies systems have been dedicated to modern agricultural irrigation and successfully active in the top irrigation fields for over 10 years and continues to bring the tried and true principles and advantages of solar hybrid power. Think about it, and then make your move. Let Roper Pumps and Agriculture Solar water management provide you with decades of reliability and lasting value. We invite you to explore the possibilities of our reliable hybrid solar powered pump solutions.